The China UnionPay Softcard library is an optional upgrade for the SAVVI Test Platform. The library contains Softcards to conduct China UnionPay UTVT contact and contactless certifications. The Softcards are used to simulate test cards either with the Savvi Programmable Cards or the FIME Card Emulator. 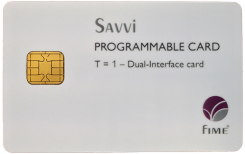 The Savvi Programmable Cards are personalised before executing each individual test case of a test plan. Once a programmable test card has been personalised with the selected Softcard it behaves like any FIME contact or contactless physical test card. The card-terminal transaction logs are simply retrieved using Savvi software and a card reader. The FIME Card Emulator relies on Softcards to simulate test cards on-the-fly when executing each individual test case of a test plan and provide greater automation. The card-terminal transaction logs are automatically retrieved, attached to the corresponding test case and analysed. The China UnionPay Softcard library is a China UnionPay UTVT Qualified Test Tool. It can be used for China UnionPay certification testing of any type of contact and contactless terminal, POS and ATM. Softcard libraries are kept up-to-date automatically thanks to the online automatic software update feature available in the tool.